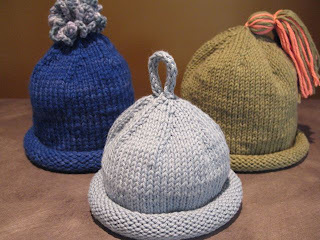 Our friends Jeff Johnson and Signe Thompson are having a baby boy very soon, so I made three little hats: same pattern, different yarns, different sizes. Baby blue Hat One is 100% cotton; deep blue Hat Two is wool for winter; green Hat Three is cotton blend. If Jeff and Signe like them, I might make more. Any excuse not to knit a sweater.